I was reading a posting on facebook a few weeks ago - someone asked about disclosing the MS diagnosis to a potential employer... hmm... really made me stop and think for a few minutes before I responded. I go back and forth a lot between being thankful/grateful that my diagnosis is such public knowledge at this company & wishing that I could rewind time & keep it to myself. The latter isn't an option, so I've embraced the fact that everyone knows that my life is going to be full of ups and downs. I'm very fortunate to work for a company that will celebrate my 'ups' and be understanding/flexible when I'm in the midst of a relapse. The most frustrating part of having MS is in fact the unknowns. I know I have them. During a somewhat severe relapse for me last summer, I was asked by my boss a very fair question – where do I see myself in 5 years, 10 years, etc. I was taken aback for a moment – but answered with the utmost honesty. I’d like to see myself right here. Just as healthy as I am today – just as able bodied as I am today – but I can’t see into the future. God didn’t grant me a crystal ball. As I think about it now, the same question can be (and quite often is) posed to fully healthy individuals as well. Like me, there is absolutely no way they can tell 100% where they will be in 5 years, 10 years, etc. I think the difference is that as a MS patient, we are forced to look the uncertainty square in the face on a daily basis. This actually makes me look at things differently. I don’t take as many things for granted. Should something happen to me, I will be able to say that while I will always wish I could have done more, I’ve done a lot. I’ve learned a lot. I’ve listened a lot. I am thankful for what I have and every day I can walk without a cane or food brace I am ecstatic! Little things that most ‘healthy’ people simply take for granted. 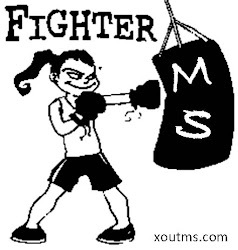 So, until the cure is found for this disease, I will be the 'Face of MS' for my co-workers. Hopefully they will all be a little more aware and understanding of others along with it. I will still have days I wish I could 'un-tell' everyone - but I'll get through it just like every other MSer out there.